Whenever patients are admitted to a health system, they are assigned a unique medical record number that both clinicians and staff use to identify, track, and cross-reference their records. Ideally, every patient receives a single, unique identifier. Reality, however, tells a different story, since many patients possess multiple medical record numbers while some even share the same identifier. These errors, known respectively as master person index (MPI) duplicates and overlays, cause caregivers to unknowingly make treatment decisions based on incomplete or inaccurate data, posing a serious risk to patient safety. Thus, it is no wonder that improving the accuracy of patient identification heads The Joint Commission’s national patient safety goals list on an annual basis. Assembling an accurate, longitudinal view of a patient’s record is akin to assembling a giant jigsaw puzzle. Pieces of that puzzle are scattered widely across a health enterprise. Moreover, accurately linking them to their rightful owner requires the amalgamation and correction of MPI errors. To accomplish this task, every hospital nationwide should either implement an MPI solution, hire a third party to clean a “dirty” MPI, or implement a combination of both approaches. Most providers assume that these actions will suffice to keep their MPI clean. However, the challenge of maintaining the data integrity of the MPI has just begun. 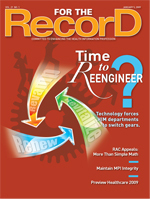 That’s because neither technology nor clean up addresses the root causes of MPI errors on their own, such as flawed registration procedures, inadequate or poorly trained staff, naming conventions that vary from one culture to another, widespread use of nicknames, and confusion caused by name changes due to marriages and divorces. To address these challenges, institutions must combine both an MPI technology solution, which includes human intervention, and the reengineering of registration processes. Unless these two elements are in place, providers’ ability to improve patient safety and quality of care will be impaired because the foundation underpinning the MPI will slowly deteriorate. Industry observers estimate that 8% to 12% of a hospital’s records are duplicates, with that rate rising to 20% or more for organizations that have acquired and/or merged with other facilities. To eliminate duplicates and provide clinicians with access to a patient’s longitudinal record, providers must comb through their primary health information system (HIS), as well as departmental applications that are downstream from their HIS and receive the errors generated in the HIS. Once hospitals identify duplicate records, they must merge and correct the errors. The larger the enterprise, the more complex the task. Unlike single-hospital entities, multihospital networks typically have more than one HIS MPI that they should integrate into an enterprise master patient index (EMPI) to generate a comprehensive view of their patients’ records. Multifacility organizations also must contend with their ancillary departments’ maintenance of separate information and registration systems. Consequently, multifacility entities must examine multiple radiology, cardiology, and other ancillary information solutions for MPI errors promulgated by the HIS in order to provide clinicians access to a patient’s complete record. After this labor-intensive task is completed, providers have an EMPI that essentially acts as a traffic cop, guiding caregivers and registrars to the right location housing the patient data. However, this is not enough to maintain the integrity of the MPI through countless new registration processes. Most HIS systems incorporate deterministic algorithms to link patient records based on exact matches or basic variations of a patient’s demographic data, including name, date of birth, gender, and Social Security number. Probabilistic-based systems deploy statistical analysis to analyze MPI data, resulting in an accuracy rate of up to 90% compared with 20% to 40% for deterministic-based systems, according to the AHIMA Practice Brief “Building an Enterprise Master Person Index.” As a result, the healthcare consulting firm Gartner strongly recommends that any healthcare organization implementing an EMPI or MPI project use systems powered by probabilistic-matching algorithms. Technology provides a powerful tool to reduce duplicate records, but it won’t eliminate MPI errors by itself. Keeping an MPI clean also requires human intervention because it’s essential for organizations to analyze and maintain data within the MPI on an ongoing basis. Even with a probabilistic-matching algorithm solution in place, maintaining an accurate MPI requires constant effort and vigilance because the data are susceptible to corruption from a variety of sources. For example, registration departments often experience high rates of turnover because these jobs are commonly entry-level positions with low pay. As a result, the facility may require clinicians to register patients during times of low volumes. To further complicate the situation, registration functions are commonly decentralized as a convenience to the patient. Oftentimes, staff members with the access and ability to register patients have not been consistently and/or adequately trained. These same staff members are often not monitored closely for compliance to training standards because the facility lacks adequate tools to conduct such surveillance. These issues contribute to a lack of adequate training for registration staff members, who already are under great pressure to process patients quickly while being held accountable for quality and productivity concerns. In addition, hospitals increasingly report that patients are accessing healthcare services by assuming another person’s identity. Sometimes, this is a result of outright identity theft. Other times, it occurs when U.S. citizens and legal residents lend their insurance card to uninsured friends and relatives. Organizations can dramatically reduce this practice by asking patients to provide a photo ID along with their insurance card. Staff can then scan the photograph into the MPI system, enabling registrars to verify a patient’s identity the next time he or she is admitted. Also, Americans have first, middle, and last names that hospitals use to coordinate patient registration. However, not every culture follows the same naming convention. Hispanics, for example, tend to have two forenames and two surnames, with the first inherited from the father and the second from the mother. It is far easier for registrars to determine a person’s first and last name on the father’s side than it is for a computer to accomplish the same task without specialized programming efforts. Finally, organizations need critical judgment to link records across the departmental information systems within an enterprise and determine which medical record number will be maintained when patients have multiple identifiers. • devise an indexing system powered by a probabilistic-matching algorithm. Depending on the size of the hospital or health network and its IT infrastructure, the cost of cleaning and maintaining an MPI could range from $100,000 to millions. If organizations fail to invest in the technology and resources necessary to maintain an MPI’s integrity, they may be forced to invest additional monies to pay for subsequent cleanups. Additionally, they will find themselves poorly positioned to improve clinician decision making, prevent medical errors, eliminate costly duplicate tests and procedures, and capture accurate data for outcomes research. An MPI not only provides the foundation for patient safety, it also serves as an essential risk management tool that protects healthcare organizations against potential reputational and financial losses resulting from malpractice lawsuits. — Tracy Peabody, RHIA, is senior manager of identity management solutions at QuadraMed Corporation.